One of the ways economists have tried to estimate the effects of the Fed’s program of large-scale asset purchases (LSAP) is using event studies of how the market responds in the thirty minutes following Fed statements of changes in the program. Yesterday’s announcement from the Federal Reserve that it is starting a gradual process of reducing its balance sheet gives us one new data point for such efforts. Here’s what happened to the yield on 10-year Treasuries yesterday as measured by the TNX contract on the Chicago Board Options Exchange (divide by 10 to translate into the annual interest rate in percentage points, and remember this is reported in Central Daylight Time). The long-term interest rate rose about 3 basis points (0.03%) in response to the news, consistent with the conclusion from earlier event studies that expansions of LSAP bring the interest rate down while contractions (like was announced yesterday) drive it up. Price of TNX contract, Sept 20. But there’s one problem with that conclusion– no one was surprised by yesterday’s announcement of the balance-sheet unwind. Details of the plan were spelled out in June, and the Fed had telegraphed pretty clearly that the announcement of its beginning would come yesterday. Indeed, the reason I was able to post graphs of what the decision meant right after the announcement was I’d actually prepared them ahead of time, confident that the announcement was coming. And here’s another problem with the natural interpretation of the figure above. LSAP is supposed to work through long-term interest rates, like the 10-year yield. But in the same 30 minutes following the FOMC statement that the 10-year rate was moving up, the price of a futures contract based on the average effective fed funds rate during January was also moving in the direction of a higher fed funds rate expected for January (subtract the number in the graph below from 100 to get an expected fed funds rate for January). The January fed funds rate is entirely driven by decisions the Fed will make at its next few meetings, and should have nothing to do with LSAP. The real news in yesterday’s announcement was not the balance-sheet unwind, but more confidence that the Fed will continue to hike the short-term interest rate. Price of January 2018 fed funds futures contract, Sept 15-21, 2017. Source: CME. Maybe the balance-sheet unwind was already priced in, or maybe it’s so gradual it doesn’t make a material difference. In any case, the movement in the 10-year Treasury rate yesterday was likely more about expectations of the future short-term interest rate that the Fed will target. Which is of course how we always thought monetary policy worked before LSAP ever started. In other words, the Fed may have already achieved much of the “normalization” of monetary policy that it’s been aiming for. This entry was posted on September 21, 2017 by James_Hamilton. 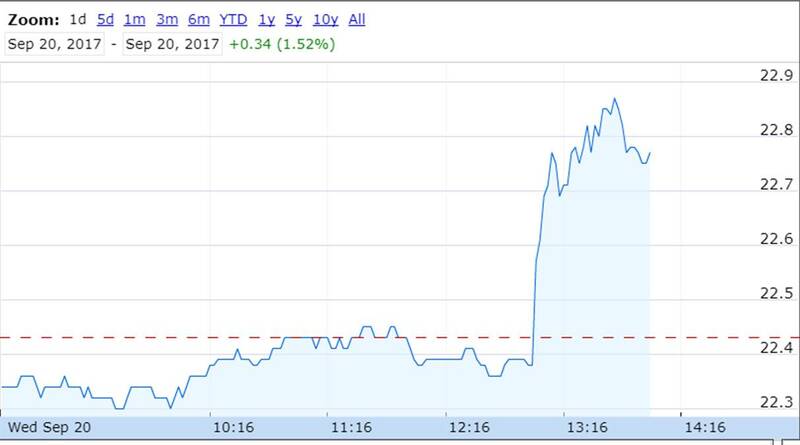 What in yesterday’s release resulted in “more confidence that the Fed will continue to hike the short-term interest rate”? Was there really anything with respect to short-term interest rates in the Committee’s statement that was unexpected? rtd: At the June FOMC meeting 12 of the 16 participants were expecting a median fed funds rate for the end of the year of 1.375 or higher, which would require one more rate hike before the end of the year. 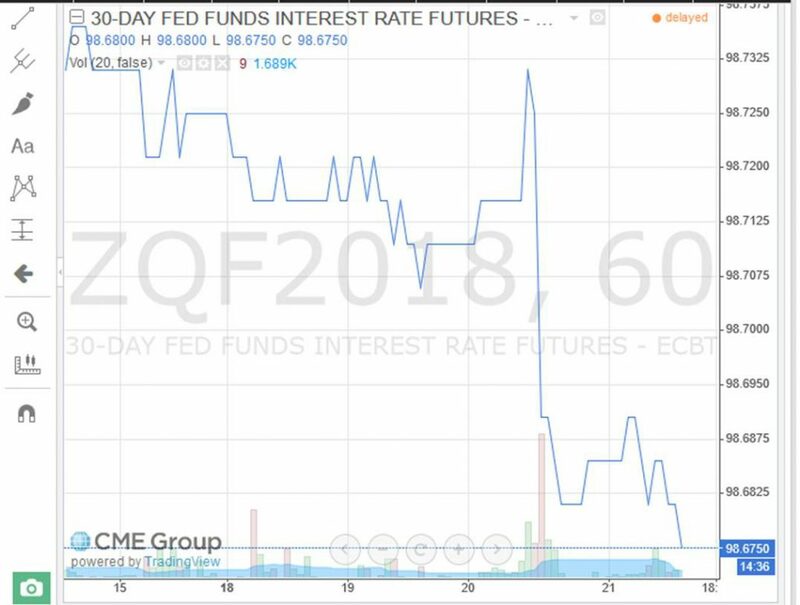 Even so, the CME inferred market probability of a FOMC target of 1.25-1.50 after the December meeting was only about 58% on Tuesday– lots of people thought the weak numbers on inflation and output might cause the Fed to hold back on that rate hike. But yesterday’s projections still had 12 of the 16 expecting 1.375 or higher. After seeing that news, the CME probability is up to about 70%. This is a great topic and you inspired me to run the numbers through my own code to estimate the size of the “federal funds rate” factor, “forward guidance” factor, and “LSAP factor” underlying the announcement. (See my NBER Working Paper on this topic for details.) I estimate a 0.04 std dev tightening of the funds rate factor, a 1.34 std dev. tightening of the forward guidance factor, and a 0.2 std dev. reduction in the LSAP factor. These numbers basically confirm your point above–most of the news in the FOMC announcement appears to have been forward guidance and not LSAPs. In response to the announcement, the markets seem to have revised up their expected path of the federal funds rate by about 5-8 bp in 2018, a moderate increase. By contrast, the LSAP news in the announcement was fairly small, probably because that part of the announcement was not much of a surprise. Yes true, LSAP is supposed to work through long-term interest rates, like the 10-year yield. But the LSAP factor does not follow ‘known secrets’, and I strongly believe the unwinding process of the balance sheet will be uneventful. Only if an unknown outside stimulus strikes, we could see surprising side effects. Yellen is no risk-taker, she will clean this up. Relax.